Dr. Angela Dussan became a Doctor of Optometry in Colombia – South America in 2004. She pursued her career in the USA becoming a Doctor of Optometry in 2010 after graduating from New England college of Optometry. Currently she is providing general health care including general but not limited to general eye exams,treatment and management of dry eye disease, glaucoma , as well as other ocular diseases/ conditions . She also has special interest in contact lenses. Dr Dussan’s philosophy is simple : every patient is treated as if she were treating her own family member with compassion and respect. 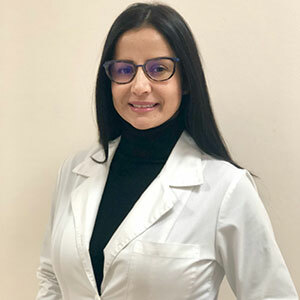 Her goals are to ensure that her patients understand all aspects of their condition and explore all possible treatments.